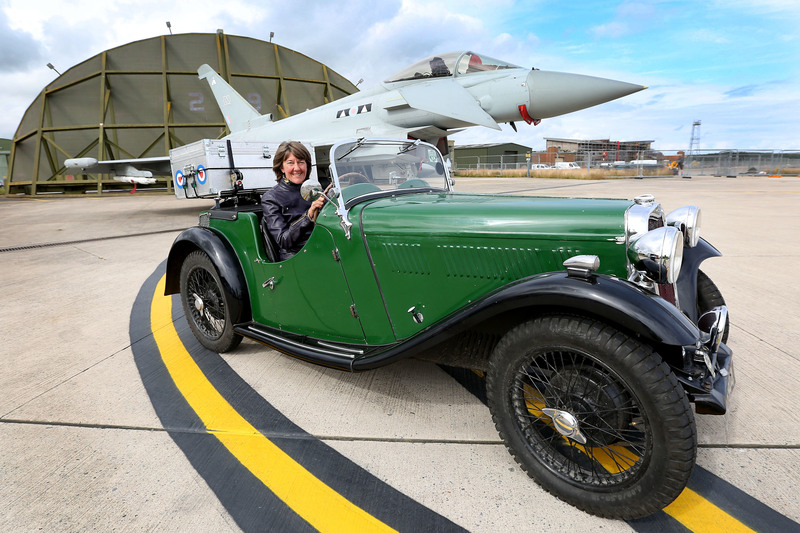 A woman who is raising funds for military heroes by travelling to every RAF station in the UK in a vintage sports car has paid a visit to Moray’s Lossiemouth base. Elizabeth Halls, from Derby in England, embarked on her tour of 60 airfields in April, in honour of her father. The 57-year-old is undertaking the challenge in her 1935 Singer Le Mans sports vehicle. Money raised on the quest will go to the RAF Benevolent Fund (RAFBF), which helped support her World War II pilot father through the final years of his life. Mrs Halls was met by Sergeant Stu Smylie of II (army co-operation) squadron and members of Lossiemouth’s RAFBF fundraising team during her stop in Moray. She said she was thrilled with the welcome on the latest stage of her journey. “My tour started in April and will last another few months, and I expect to cover 6,000 miles over the next 74 days,” she said. “The reason why I wanted to support the RAF Benevolent Fund was because they were so wonderful to my family when my father developed Parkinson’s disease later in life. “They provided a stair lift, and helped my mother work out the allowances and benefits available to him as an ex-serviceman. Chairwoman of the Lossiemouth RAFBF, Karen Cox, said: “We spent all day with Mrs Halls and she said Lossiemouth was the friendliest base she had visited. She added: “We always love it when people go out of their way to raise money for the fund, and it inspires us to keep raising more as well. The RAFBF offers support to personnel, their families and veterans. Mrs Halls’s father died in 2012, and shortly after his daughter compiled his memoirs into a book titled Flying Blind: The Story Of A Second World War Night Fighter Pilot.